This is the second issue of the fourth volume (Vol IV, no. 2). The volumes run from April to March. In this issue, there are two plates and two pages of description. 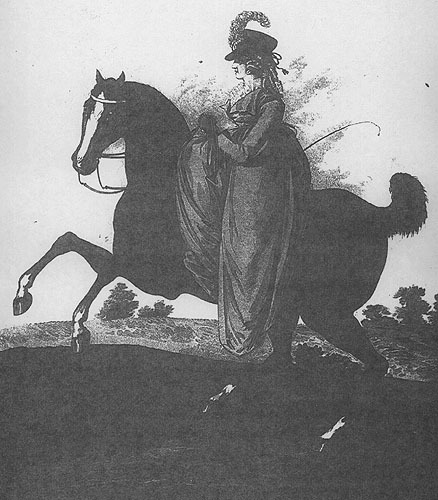 Plate one features figure 138 and is labelled "Hyde Park, Riding Dress." It is shown below in greyscale. Plate two features figures 139 and 140 and is of evening dresses. The text reads: "The front hair combed plain; the sides and hind hair in ringlets. Black beaver hat, with a gold band and tassels; round blue ostrich feather placed in the front of the hat. Riding dress of blue cloth. Double plaiting of Valenciennes lace round the neck. Large gold hoop ear-ring. York tan gloves. Purple Spanish leather shoes."